Searching for that last minute holiday gift? Maybe you have a loved one who's crazy about celebrity chefs. Or you know a TV fan who craves the dishes prepared on a favorite show. Why not get one of these new cookbooks based on hot TV series or penned by some of TV's most beloved culinary masters and favorite celebrities? Just some food for thought. Fans of the vamp saga will devour this book based on the menus of Fangtasia and Merlotte's Bar and Grill. 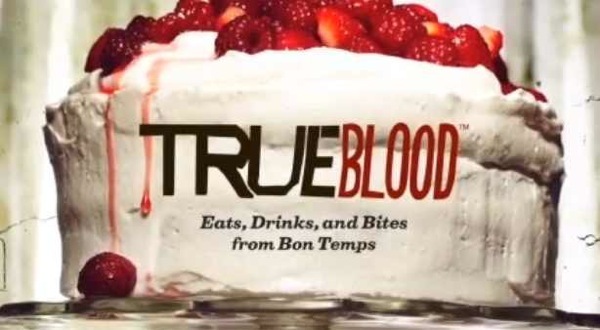 Written by True Blood creator Alan Ball, this book has 80 recipes and 150 photos from the series. Recipes include Bon Temps Bloody Mary, Lettie Mae Daniel's Hoecakes and Jessica Hamby's Chicken-Fried Love with Gravy. Step back in time to the glamorous world of Downton Abbey while preparing dishes like Lady Mary's Crab Canapes, Sybil's Ginger Nut Biscuits, Ethel's Beloved Crepes Suzette, Mr. Bates' Chicken and Mushroom Pie and Mrs. Patmore's Christmas Pudding. Practice some of the over 150 recipes now and be ready to serve them up for a Season 3 premiere party on January 6. Top Chef competitor and fan favorite and The CHew co-host Carla Hall has released her first cookbook featuring recipes she grew up on on the south. The 100 recipes are twists on classic dishes offering lighter and healthier versions on the best of the south. Recipes include Down-Home Deviled Eggs with Smoky Bacon, Spicy Carrot-Ginger Soup, Chicken Pot Pie with buttery crust on the bottom and Five-Flavor Pound Cake. After losing weight as the Jenny Craig spokesperson, One Day at a Time and Hot in Cleveland sat Valerie Bertinelli released several book about losing weight and staying fit. This time she's sharing the Italian recipes of her childhood and enjoying them without overindulging. The book is filled with over 100 recipes, pictures of the star in her kitchen, nutrition info for each recipe and healthy living tips. The follow up to Frank DeCaro's first book (The Dead Celebrity Christmas Cookbook), this new edition is full of holiday treats from celebs who have gone to the great Christmas party in the sky. Recipes include Bing Crosby's Sugar Cookies, Burl Ives' Stuffed Leg of Goat Hawaiian, Dinah Shore's Fruitcake, Edmund Gwenn's Christmas Cup, John Lennon's Cocoa and Guy Lombardo's Lobster Lombardo. Actor Stanley Tucci's family hails from Calabria in Southern Italy and food has always been a big part of his life. He's an avid cook with an Italian stone pizza oven in his kitchen among every other cooking utensil known to man. With 200 recipes, each with its own wine pairing and forward by Mario Batali, this cookbook features Italian delights and the actor's memories of his family through the years.